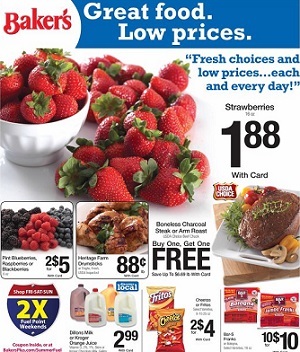 This week Baker’s weekly ad circulars, coupons and specials. Every Baker’s store ad features weekly deals and promotions on grocery products. Find the latest ad specials: Chicken of the Sea Chunk Light Tuna; Boneless Charcoal Steak or Arm Roast; Dillons Milk or Kroger Orange Juice; Heritage Farm Drumsticks; Blueberries, Raspberries or Blackberries; Cap’n Crunch or Life Cereal; Iceberg, Romaine or Red or Green Leaf Lettuce; Gala, Granny Smith, Red or Golden Delicious Apples; Red Cherries; Hershey’s or Kit-Kat Candy Bar; Simple Truth Cage Free Eggs; Boneless Center Cut Pork Loin Chops; USDA Choice Flat Iron Steaks; Johnsonville Smoked Sausage; Tuna or Swordfish Steaks; Coca-Cola; Kroger Cottage Cheese or Sour Cream; Entenmann’s Donuts; Smart Ones Classic Creations; Heinz Ketchup; Tombstone or DiGiorno Pizza; Oster Blender; Hershey’s Candy; and more. Baker’s stores activate their latest weekly ads every Wednesday. To see the weekly ad for your favorite store, search for your store and select the weekly ad link. You can search for a store by ZIP Code or City, State. Baker’s is a supermarket chain operating in the metro area of Omaha, Nebraska. Baker’s stores offer a convenient shopping experience that includes everything from meat, breads, dairy, pasta, fresh produce and more.